In 3 weeks, the whole world will be celebrating Valentine's Day. I am secretly a big fan. Receiving flowers always make my heart skip a beat. I can't remember the last time I got flowers, but I can remember the last time I adorn my nails with florals and hearts to celebrate the day of hearts. I still don't know what Valentine's nail art I'll be actually wearing on the 14th of February. But perhaps I can start sharing with you a few ideas and hopefully you'll get some inspiration for your nails. You're probably wondering why I named this design "Accidental Love". Well, it is all because the results were not planned and kept it anyway because I loved it. Still confusing? You see, I really intended to have those small red hearts and framing each with curvy lines. The accident was on how I painted the lines. While I was preparing the black paint, I didn't realize that I watered it a little generously. So when I started painting the lines, it didn't come out defined. But, I really loved the ragged look on the lines and that made me continue painting like so. Have you experienced something like this as well? 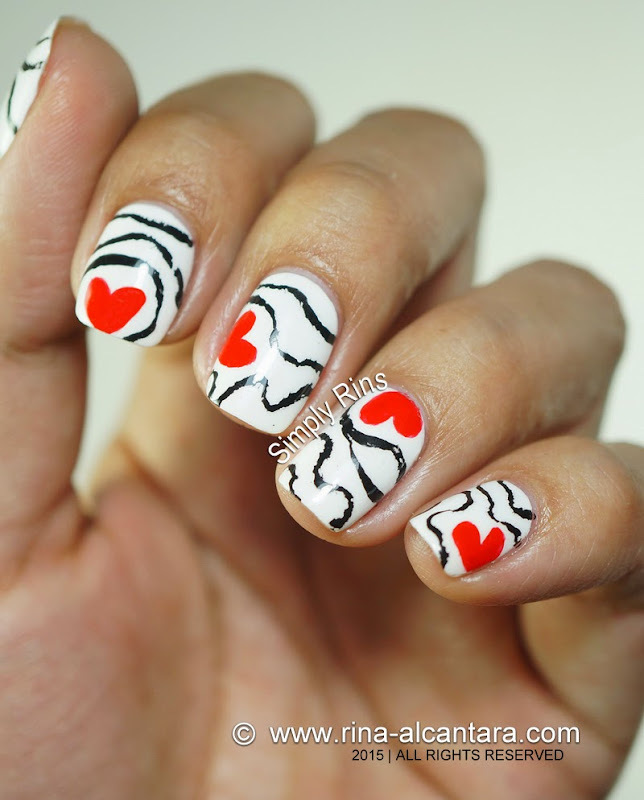 I used traditional Valentine's colors for this nail art -- red, white, and black. You could alternate the colors if you prefer. I thought that a black background with red hearts and white lines would look good too. For the white base, I used 2 coats of OPI Alpine Snow. I freehanded the design using acrylic paints and a detail nail art brush. This nail design is easy to create, even if you are a nail art beginner and even if you have trouble working with your non-dominant hand. The lines do not need to be precise since we are aiming for that rough look. The hearts can easily be painted by loading your brush with paint and drawing a "v". Oh, a quick reminder. Make sure the paint is completely dry before you put on your favorite top coat. Take note that we watered down the paint and it will take a longer time to dry on the nails. Adding a top coat right away may result to smudges. I hope you liked this simple Valentine's nail art design. It's an eye-catcher and looks like a puzzle from afar. Thank you so much, girls. Love this, Rins. What a great job you've done.